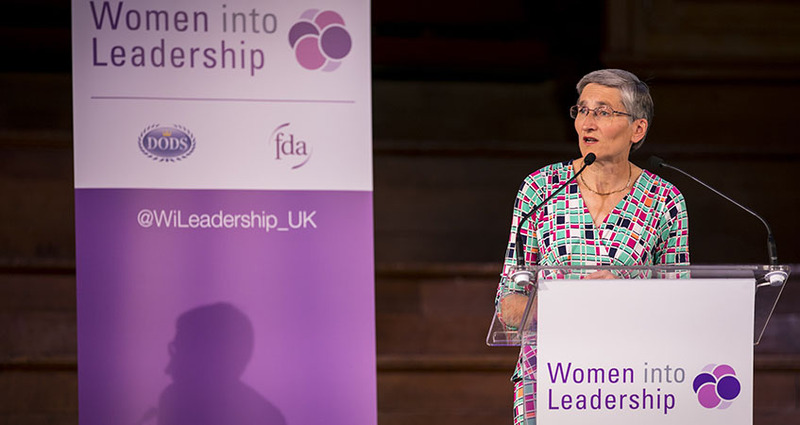 Clare Moriarty, Permanent Secretary of the Department for Environment, Food and Rural Affairs (Defra), spoke at our 2018 London Women into Leadership (WiL) conference on "positioning yourself as a leader". In the below speech, she discussed her metrics of success, and the importance of red shoelaces. It’s lovely to be here today, looking out into a sea of women leaders at different stages of your careers. (And if there are any men here, you’re very welcome.) I’m going to talk today about finding myself as a leader, how I’d like to redefine success, and a little bit about red shoelaces. Let’s start with one very obvious success, which is these conferences themselves. FDA and Dods are to be congratulated on them. Women into Leadership has grown steadily over the years. I remember running breakouts at early events in Victoria that were always buzzing with energy, but a lot smaller than today’s. Now there are Women into Leadership conferences around the UK, including this amazing event with 850 people. I’ve spoken at Women into Leadership events in Leeds and Cardiff in the last couple of years, but I last spoke at the London conference in 2015, just a few weeks in to my role as Permanent Secretary of Defra. It also happened to be the 30th anniversary of my joining the civil service. I reflected then on how long it took me to understand myself as leader. Firstly acknowledging that my role was indeed to lead, then how I wanted to do it and what I wanted to do with it. I was a full 20 years into my career before I really focused on leadership as what I was there for. My lightbulb moment was when I moved from the Department of Health, where I’d spent my entire career up to that point, to what’s now the Ministry of Justice, as Constitution Director. Overnight I lost my subject knowledge and had to work out what to do with my time. I was very fortunate in that I inherited a Directorate that was relatively newly-formed, with a real appetite for development and lots of cross-cutting initiatives. I discovered that supporting those initiatives, talking to people individually and in groups – helping them grow – was actually real work after all. It helped the Directorate perform better and by the way it was fun! By the time I finished that job I was sold on leadership. I’d redefined myself from someone who knew stuff and did stuff to someone who made it possible for others to do stuff. Or to put it another way, in my favourite definition of leadership, making it possible for others to do their best work. But increasingly I think it’s not enough just to be a leader. I need to decide what to do with my leadership, and how to position myself. What’s the difference that I want to make? What does success look like for me? That’s been the theme of my last ten years and will be for as long as I remain in the civil service. •Be yourself (and don’t expect others to be like you). I still set a lot of store by those tenets, and still pass them on to others. But if that’s where I was in September 2015, where have three years taken me? It’s been a voyage of discovery around Defra, and around Brexit. I’m amazed by what Defra and its delivery bodies are responsible for. Nature reserves and illegal waste sites, applied marine research and antimicrobial resistance. To take a few topical examples: ivory, scallop wars and decontamination. The EU referendum was a huge inflection point for us. I’ve now been going around for over two years saying that Defra is the domestic department most affected by Brexit, and no-one’s challenged me for the title yet. Brexit has put a spotlight on a new set of issues for us, from chemicals regulation and trade in endangered species to biosecurity at the border. We have a huge EU exit portfolio, and legislation coming out of our ears. There are big operational issues to work through, and lots more people. That’s been testing for me as a leader, right from the day after the referendum when I had to work out what to say to colleagues who’ve spent their working lives engaging with the EU. It’s been testing as we’ve had to change as a department, keeping our traditional strength in negotiations while becoming a project delivery organisation too. Testing as we’ve grown by over 40% in a year, making Defra welcome to those who’ve joined and learning how to operate across different locations. Through all that the question running in the back of my head has been how do I want to lead? Where do I want to make a difference? The two words I keep coming back to are open and inclusive. Open has been my watchword since joining Defra. It started with a commitment to open data which led to us releasing 10,000 data sets in a year, including some truly massive ones. But opening our data was at most half the issue. More important was the effect it had on open working among colleagues across many organisations in the Defra group, and with a range of external partners from universities to charities to commercial organisations. That led to interesting discussions about how open government relates to accountability, and also to user-centred design. It took us into how we can be more open as individuals, sharing a bit more about ourselves as a way of making connections with others: building respect and trust. Open has all sorts of dimensions. It encompasses being open to challenge, open to new experiences, open to new ideas and to difference – which in turn links to my other key word, inclusive. Inclusive has become an easy word to bandy around. Defra’s strategy for equality, diversity and inclusion has on the first page the line “diversity is the mix, inclusion is making the mix work”. I’m proud to have planted that phrase in the Civil Service Diversity & Inclusion strategy and now it seems to be everywhere, along with its counterpart “diversity is being invited to the dance, inclusion is being asked to dance”. I love the concept, but there’s always a danger that we slide into lip-service when we use it. So what’s important to me about being inclusive? I come back to two slightly technical terms: unconscious bias and the deficit model. Unconscious bias is a term that captures the assumptions that are so deeply engrained that we don’t notice them. The deficit model is the tendency to try and fix people rather than the system. Put them together, and the end result is to try and fit people into a norm that we don’t even realise exists. It’s often very kindly meant, but it’s the opposite of inclusive. Let me tell you a bit of my story. I call myself one of the 20% generation. When I joined the civil service as a fast streamer in the mid-1980s, women made up 20% of the fast stream. When I was promoted to the Senior Civil Service, women made up 20% of the SCS. And when I became a Permanent Secretary, 20% of Perm Secs were women. At the same time, I’m middle class, white, heterosexual and non-disabled. Other than that woman bit, you could say I’m very establishment – except for a tendency to think differently, to name the elephant in the room. In the Ministry of Justice, I had a lucky break when I was asked to chair a group looking at how to bring alive the civil service model of leadership. Fantastic, I thought: an opportunity to pop the cork from underneath. But when I went out on a limb and tried to be a bit open with my peers – talking about how I felt – the branch got sawn off pretty promptly. And what worked with my team didn’t go down well with my superiors. So that was a “learning experience”. In the Department of Transport I was in a highly privileged position as a Director General. But still I sometimes felt I was talking a different language. I was talking “people” when my colleagues were talking “task”. In every leadership group I was part of, when we got to the bit where we shared our Myers Briggs profiles, I was F and everyone else was T.
So now we come to the red shoelaces. I did some serious reflection before I became a Perm Sec. On the Individual Development Programme I had lot of conversations with a lot of well-meaning people, who were genuinely trying to help me get on. Their message to me was “we’re sure you can make it to be a Perm Sec, but you just need to conform a bit more to get through the door”. Mine in return was “I think I’ve conformed enough”. My metaphor for this was that I’d started off in colourful clothes, and imperceptibly changed over the years into sober ones until the only colourful bit left was bright red shoelaces. Still they said “can you not just take out the pesky red shoelaces while you get through the door? You can put them on again afterwards”. While I replied “no – if they come out I’ll never get them back in again”. They were half right, I was half right. I never did take out my red shoelaces, and somehow got through the door with them on, so I was right not to take them out. But equally it has been possible to add back more colour on the other side of the door. Some of the things I thought would be barriers turned out not to be – so they were right about that. But that does worry me too, because it shouldn’t be easier to be different as a Perm Sec than elsewhere in the civil service. Now it really drives where I stand as a leader. My first job is to use my influence to good effect, trying to counteract the normative tendency. Everywhere I can, I try to give the same message: that people are valued as they are, not for the bits that most fit into a predetermined mould. There’s good research evidence that people from different backgrounds are praised in performance management reviews for behaviour that’s more like the norm. That’s why I take issue when people – especially women – are encouraged to “be more confident”. Not because I have anything against confidence, but because “women should be more confident” tends to mean “confident women should look more like confident men”. That’s why I’m a signed-up LGBT+ ally, giving visible support so that more people feel comfortable being open about who they are. It’s also why I encourage people who feel able to talk about mental health issues. It’s not for me to tell people to be open, but it is my job – and the job of any leader – to create an environment where those who feel able to be open have a positive experience, not a negative one. So my first job is to use my influence to good effect, and my second is to share it, not hoard it. I say openly that my mission is to change the civil service. I can’t do it on my own so I’m constantly looking to encourage agents of change. I sometimes say the most useful thing I can do is nurture rebels. Rebels – not to be confused with cynics – are people trying to improve, change and innovate at work, regardless of whether they have a formal position of authority. Another term I’ve come across is tempered radicals, also known as boat-rockers. People who change their organisations not though revolution, but through walking the tightrope between conformity and rebellion. Rebels, boat-rockers and tempered radicals are valuable people. They deserve to be cherished: they’re taking risks for change. They’re often not in positions of formal authority so it may be more difficult for them to wear the red shoelaces, or the red hat or jumper, than it is for me. But just think what they can do with a bit more licence. I’m sure some of you here today are in that category. 850 women is an amazing sample. If my maths is right, then getting on for 0.5% of all women in the civil service are in this room today. There are bound to be change agents among you. There are people in this room who will be Perm Secs, Director Generals, Chief Executives of Agencies. There are people who’ll find your leadership role outside civil and public service. There are people who may not be destined to be positional or hierarchical leaders but who will lead in other ways, and make a difference. I want to make it possible for more women to progress to senior roles. My main purpose in being here today is to say to you that you can succeed without conforming in every way: without taking out your red shoelaces. For me, that’s what redefining success looks like. But I also want to leave you with the message that wherever you are on your journey, you can be a leader if you want to make a difference. And as a leader you have a responsibility to decide how you want to make a difference – and then just go for it! National Officer Victoria Taylor discusses the "concerning statistics nestled in this data".